Microdermabrasion is a non-surgical way to rejuvenate skin. Using tiny crystals, this treatment exfoliates the surface layer of skin and removes impurities. The summer tan you may try to achieve every year is doing damage to your skin. While you probably enjoy the looks of a tan now, the summer glow isn’t worth the risk of your skin health. Along with causing a temporarily darker skin tone, UVA rays also cause wrinkles and fine lines. Avoid these signs of aging, but still achieve the look you desire, by getting a spray tan. One of the best ways to help restore the youthfulness of aging or damaged skin is to undergo a chemical peel procedure. According to Dr. Beckman, a chemical peel refers to a procedure that is actually, in some sense, a form of injury to your skin. As Dr. B describes it, “We injure skin to let it then heal with a more normal result.” This procedure requires proper care afterwards and it is also very important to prepare the skin before treatment to ensure the best results. 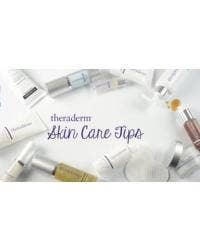 Users of Theraderm NuPeel Natural Enzyme Peel know it makes their faces soft and radiant. What they may not know is that this antioxidant-rich papaya enzyme gel is great for use on the entire body.